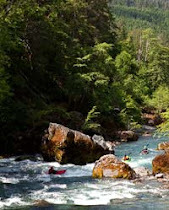 For those of us keeping tabs on the effort to protect seventeen miles of the National Wild & Scenic Chetco River from being mined, the clock is now ticking. July 30, 2014, was the one-year mark for the 5-year temporary mineral withdrawal, put in place by the Secretary of Interior at the request of the U.S. Forest Service. The purpose of the withdrawal is to give Congress time to pass a law that would provide permanent protection for our river and its extraordinary values from mining. In the meantime, Congressman DeFazio and Senators Wyden and Merkley—long-time champions of protection for the Chetco River—have introduced bills into Congress that would permanently withdraw the "Scenic" and "Recreational" sections of the river from the 1872 Mining Law, upstream of the Forest Service boundary. However, what was once called the Chetco River Protection Act has become lodged in what's now called the O&C bill, a controversial piece of legislation that our elected officials hope can allow for a substantial increase in logging on BLM lands in western Oregon to fund broke counties while also providing some important increases in environmental protection, including increased wilderness in the Rogue watershed, a salmon and botanical area in the upper Illinois watershed, and more. The language for permanent protection of the National Wild and Scenic reach of the Chetco remains included in the latest version of Senator Wyden's O&C bill, released on Aug. 2014. If you've been following the news, you know that the O&C bill is disliked by most all stakeholders --it does not increase timber harvests enough to satisfy industry and the counties, yet from the perspective of most environmental groups, it allows too much cutting, reduces riparian buffers, and significantly rolls back the opportunity for public involvement through appeals. Nevertheless, Senator Wyden remains committed to finding a way to move his bill forward. And so, unfortunately, the fate of our river remains entangled in this highly contested legislation. Here at summer's end, with record low flows, the need to protect the Chetco's watershed and river bed remains particularly apparent. At times like these, with drought taxing natural systems, resilience is of key importance. 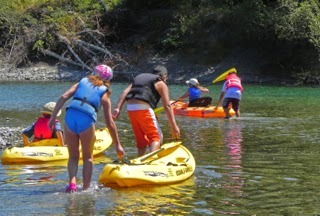 Protecting the National Wild and Scenic Chetco from a future of instream mining threats is an important investment in the future our our watershed's health.